Early registration rates are in green. Register by June 19 to save! The registration fee is $25 per student, per academic year and is nonrefundable. Note: Course tuition must be paid in full to reserve a seat in the course of your choice. Note: Our normal drop and refund policy does not apply to Moot Court Intensive or SAT® Prep Genius. Learn more about HSLDA and how you can pay the discounted member rate. Need to look up your member number? You can check here. Find out how you can get special group pricing for your students. If you must drop a course you have registered to take, you may be eligible for a partial tuition refund. For more information about refund eligibility, please visit our drop and refund policy page. Please remember that $125 of the tuition for each course and the $25 registration fee are non-refundable. Moot Court Intensive Drop Policy: For any drop requests submitted before January 27, 2020 (10 business days from the start of the course), the registrant will receive a $100 refund. No tuition refunds will be offered after January 27, 2020. The $25 registration fee is non-refundable. SAT® Prep Genius Drop and Refund policy: For any drop requests submitted by the 10th business day of the course, the registrant will receive a $100 refund. No tuition refunds will be offered after the 10th business day of the course. The $25 registration fee is non-refundable. Books and materials are not included in the tuition cost for each course. Students are responsible for obtaining required books and other resources. The cost of books varies depending on the course and on the types of books students purchase (for example, new books vs. used books, hard copy format vs. electronic format). 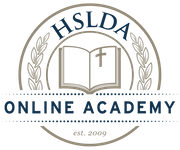 You can view information about books and materials on each course page or by visiting the HSLDA Online Academy bookstore. Please note that you will need to create a distinct bookstore account, separate from your Academy username and password. If you have any questions about HSLDA Online Academy’s textbook requirements, please contact us.